The City has hundreds of locations that were once gas stations, although today the remaining service stations are becoming increasingly rare. Here’s one on the corner of Main Street and Terminal Avenue, seen in 1940s. It’s Al Deeming’s Union Oil gas and service station. The leasee was Albert W Deeming, and we wondered if he might be the son of Albert Deeming of North Vancouver, who ran a fruit ranch, but according to his marriage certificate Albert W was the son of Caleb James Deeming. However, the 1891 Census shows both Albert and James Deeming were brothers, and had arrived from England, living in Mountain District (Nanaimo) and working as miners for the New Vancouver Coal Co. In 1911 Albert W was aged six, and his father had become a farmer in Delta. This gas station first appears in the street directory in 1924, as do the industrial buildings in the background which once housed Neon Products’, the BC Valve Company and Massey Harris’s agricultural implement showroom beyond the gas bar. The building further east dates from 1929. The buildings are still there today, although now they are wholesale and retail warehouse buildings for furniture and floors tiles. In the 1950s the Terminal Service and gas station was run by L E and Mrs M S Love. There’s a 1980s image in the Archives showing that the gas station was still here when the Skytrain was under construction across the street. By then it was a Gulf gasoline station, with a new canopy. Today it’s the site of the city’s first Temporary Modular Housing, intended to help meet the current homelessness situation. Built in a matter of days, it has 40 modular apartment units that can be demounted and reassembled on another site when redevelopment plans come forward for this part of False Creek Flats, currently owned by the City of Vancouver. The City Market was an ambitious investment, that proved to be a bit too out of the way to succeed. Built on Westminster Avenue (today’s Main Street) it was located on the far side of the bridge that crossed the False Creek Flats, so was effectively ‘out of town’. It was fabulously ornate and state-of-the-art , with a cast iron façade and a lot of glazing; seen here in 1910. Opened in 1908, the market operations replaced an earlier city building that was re-purposed as City Hall. This building was an unusually decorative design by W T Whiteway, who supervised the site preparations in 1907, reporting to the Council Market and Industries Committee that “the market wharf had been completed by the B. C. Contract Co. in a very satisfactory manner. He had seen no traces of toredoes when examining it. He had examined other wharves near there and found that toredoes did not seem to in that part of False creek. It was decided to charge the cost of the roadway approaching the market to the board of works.” Bayfield and Williams successfully bid to build the market at a cost of $25,233. (Toredoes – shipworms – are the marine creatures – actually a type of saltwater clam- that live on wood, and tunnel into underwater piers and pilings causing damage and destruction to submarine timber structures). The market opened in August 1908, and the Daily World reported the first day of operations. In passing it referenced what must have been the city’s first green roof, and a rather innovative way of attracting customers. “When the door of the new building with the imitation moss – covered roof, at the southern end of Westminster avenue bridge, were thrown open this morning there were many women present, for it had gone forth that the woman wan made the first purchase at the opening of the market would have, the honor of declaring the market open and also receive, as a premium, a leg of mutton. Besides the women who wished the honor and the mutton there were several hundred spectators, mostly of the male persuasion, who cheered the fair contestants. “All ready,” shouted the clerk. “All ready,” repeated the caretaker, and the echoes had not been caught up from the back walls before the rush was on“. The newspaper carried several columns of details of the competition for the mutton, won by Mrs. Allen of Columbia Avenue “A pyramid of boxes of plums foil over to the stairway and the crushed fruit mude the ascent more perilous. One lady fell and the othes rushed unchecked over her prostrate body, knowing that the plum would make a cushion to save her from injury, even if they did stain her frock“. Despite attracting 3,000 customers on the first day, the market was soon a failure, with few residents having any other reason to travel so far out of the city in that direction. It closed in the early 1920s, and was leased to a variety of industries, including a wire works, poultry dealer and a fish ball manufacturer. In 1925 it burned to the ground; all the firefighters could do was save the lives of some of the chickens. The site was reused by a variety of industrial companies, including Excelsior Paper Stock and Spicer’s Asbestos Ltd in the 1930s. Today it’s a surface parking lot owned by the City of Vancouver, awaiting a future development as part of South East False Creek. These big industrial buildings were first constructed in 1899, and initially expanded in 1903. W T Dalton designed the first buildings, and Dalton and Eveleigh the expansion which was for an iron frame car barn costing $14,000. It was this building, so the building at the front is probably the 1899 structure, and the barn behind the addition. The BC Electric Railway Co ran the trams (streetcars) and suburbans that helped to shape the expansion of the City of Vancouver, and many of the suburban municipalities as well. There’s a bit of a debate about the date of this image – the City Archives think it’s from 1899, but other authors say it’s 1904 (which seems to make more sense). It had nine parallel tracks that could squeeze 45 streetcars inside the largest single-storey structure in the city at the time. There were four repair pits and an electric hoist. There was small store (behind the streetcar) run by George Aldrid where employees could buy fruit and tobacco. The building was further expanded in 1912 when the BC Electric Railway Co planned a $40,000 addition built by Snider & Brethour. We’re unsure what that involved, as the 1912 insurance map shows a much larger building already completed along the entire street to Prior Street. We assume this happened sometime in the late 1900s when there’s a gap in available building permits. (In 1914 the rapidly expanding fleet saw the company build a new two-storey reinforced concrete barn at Main and 14th Avenue, replacing earlier structures at a cost of $300,000). 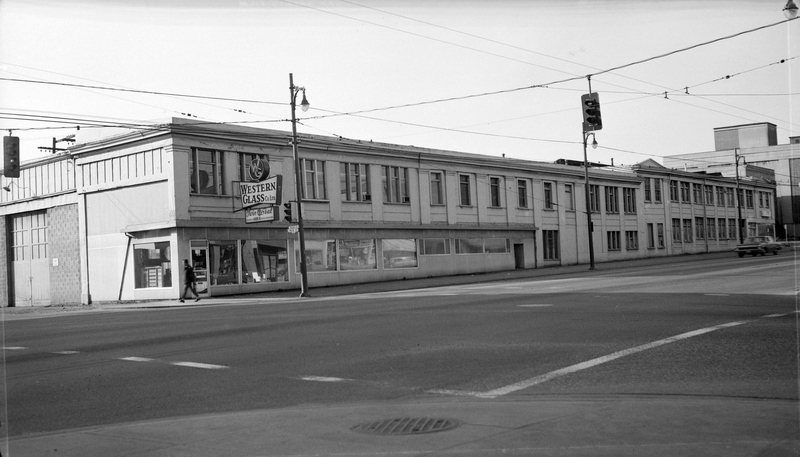 The expanded buildings that were built here can be seen in this 1969 W E Graham Archives image, long after streetcars had gone, and before the buildings were torn down to be replaced with the new Georgia Viaduct (at the eastern end it’s some distance from Georgia, between Union and Prior Street). The view will change again once the viaducts have been removed. Cemco weren’t as mysterious as this suggests, and they didn’t disappear after the war. They had been in operation since 1934, in the Mount Pleasant area, with S Darnborough as Managing Director. Before this new factory was built they were at 165 W 4th Ave. S Darnborough was Sidney, (although he was really T S Darnborough), and before Cemco he was president of Canadian Electrical Manufacturing Co (which would be CEMCO’s precursor), with a home on Osler in Shaughnessy. Before CEMCO, in the 1920s, Sid Darnborough was an electrical contractor, living on West 8th Avenue. The company were still operating from this E 5th address in 1949, with Sid still running the company, having moved to University Boulevard. They were here in the mid 1950s but by then Sid had retired and B W Ball had taken over as President of the company. A year earlier they had expanded eastwards by adding a new factory in Granby, Ontario. At the time they were described as specializing in switchgear for industrial uses. They also made electrical instruments, street light fixtures “and many other products of a similar nature for industrial and commercial use”. 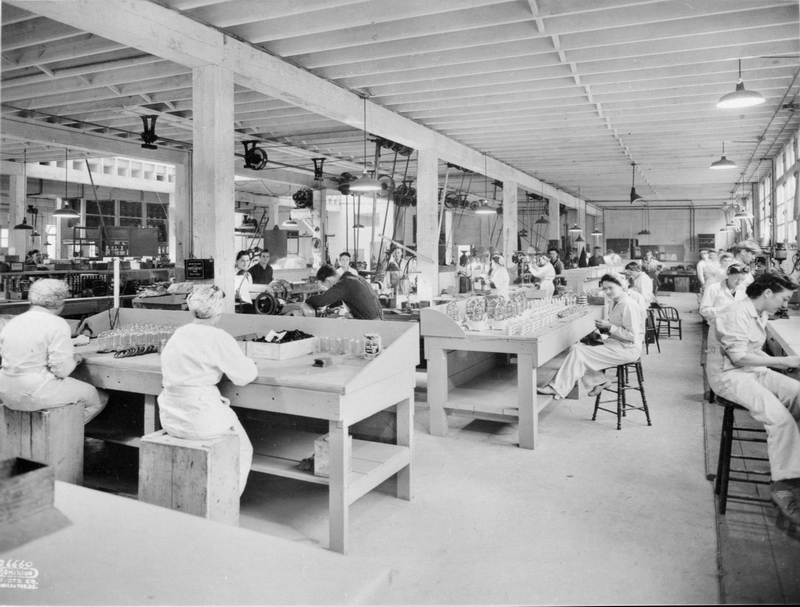 The 1943 image of the factory floor shows what looks a lot like light fittings being assembled by a workforce with a high proportion of female workers. A little more insight about the company is contained in a 1946 court case where the company’s salesman, Peter Van Snellenberg, sued for wrongful dismissal after discovery that he had added commission on the sales tax payable on a few of the orders he had obtained. He was dismissed in 1943 (the year our images were shot), so although the company has been described as ‘building radar and radio equipment for ships being built for the war’ (which they may have been doing), they were also selling their products on the open market. In 1958 the Federal Pacific Electric Company of Newark New Jersey acquired Cemco, where it was described as “engaged in manufacture and sale of electrical switchgear, air circuit breakers, air switches, load break switches, fusible breakers, cable terminal potheads and related apparatus for the distribution and control of electricity”. The Cemco Factory was designed by Australian-born architect H.H. Simmonds, and used pour-in-place construction that retained the marks of the formwork. It supposed heritage value earned it a reprieve from redevelopment, but also permitted a larger office project (yet to commence) to be built behind the retained walls. This 1927 warehouse and office was the second location for Wilkinson Steel. The company was founded by Frank Wilkinson in 1910 on Beach Avenue as the sole distributor for U.S. Steel in British Columbia. Frank Wilkinson was born in England, and arrived in Canada in 1891. His wife Alice was also English, but had arrived a year earlier. They must have spent quite a bit of time in Quebec as all their children, (they had at least six), were born there, the youngest in 1909. In 1911 Alice’s sister, Hilda Baker was living with the family; in 1921 they had a domestic servant. There were two houses built on this corner in 1904; they only survived a little over 20 years. In the 1920s the neighbourhood was changing from a residential area to an industrial and commercial area, although there are still a few residential pockets even today. This image was shot in 1946, and shows a couple of houses still located on Columbia Street, behind the warehouse. In 1958 the company moved to SW Marine Drive, where they still operate today. In 1973 the existing two storey office and production space was built; which we’re pretty certain incorporated some of the original warehouse building. It’s now home to City TV’s studios.